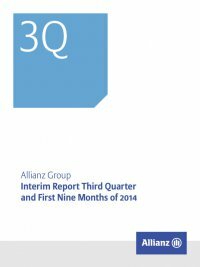 Interim Report Third Quarter and First Nine Months of 2014 Allianz Group6 Management’s assessment of third quarter 2014 results Our total revenues grew 14.5 % to € 28.8 bn. On an internal basis1, rev- enues increased by 14.3 %. This was largely driven by our Life/Health business segment, which recorded strong growth in fixed-indexed annuity and unit-linked sales in the United States and Italy, respec- tively. Revenues from our Property-Casualty business segment also increased while operating revenues in our Asset Management busi- ness declined modestly. Our operating profit increased by 5.2 % to € 2,650 mn, driven by a higher underwriting result from our Property-Casualty business. Our Life/Healthbusinessrecordedsolidoperatingperformance.Operating profit from our Asset Management business segment declined main- ly due to lower management and loading fees. The decrease in the operating result from the Corporate and Other business segment was attributable to Holding & Treasury. Our net income increased by 10.2 % to € 1,687 mn due to the higher operating profit and lower non-operating impairments. Net income attributable to shareholders and non-controlling interests amounted to € 1,606 mn (3Q 2013: € 1,445 mn) and € 81 mn (3Q 2013: € 85 mn) respectively. Shareholders’ equity reached a new high of € 58.2 bn, an increase of € 8.1 bn compared to 31 December 2013. Our conglomerate solvency ratio strengthened by three percentage points to 184 %.2 1 Internal total revenue growth excludes the effects of foreign currency translation as well as acquisitions and disposals. Please refer to page 45 for a reconciliation of nominal total revenue growth to internal total revenue growth for each of our business segments and the ­Allianz Group as a whole. 2 Conglomerate solvency ratio as of 30 September 2014 was adjusted for the potential calls of hybrid capital (subordinated bonds) of € 1.4 bn in the coming year. Excluding this adjustment, the solvency ratio would be 190 % as of 30 September 2014. Total revenues3 2014 to 2013 third quarter comparison Total revenues – BUSINESS Segments � mn 3Q 20143Q 2013 30,000 20,000 10,000 28,7811 15,853 +25.0 % 11,254 +4.7 % 1,618 135 (2.5) % +0.8 % +14.3 % 25,1441 12,698 10,650 1,703 131 Property-Casualty Life/Health Asset Management Corporate and Other Internal growth 1 Total revenues include € (80) mn (3Q 2013: € (39) mn) from consolidation for 3Q 2014. Property-Casualty gross premiums written were up 5.7 % to € 11.3 bn. On an internal basis, our gross premiums written increased by 4.7 %. This was mainly due to a favorable volume effect of 4.0 % and a posi- tive price effect of 0.8 %. We recorded strong growth at AGCS, in the United Kingdom and Germany. Life/Health statutory premiums amounted to € 15.9 bn, a strong increase of 25.0 % on an internal basis, driven by single premium unit- linked products in Italy and Taiwan as well as fixed-indexed annuity sales in the United States. Asset Management operating revenues went down by € 85 mn to € 1,618 mn. This was largely due to lower management and loading fees, mainly resulting from lower margins, but also reflects the allo- cation of certain entities to other business segments.4Third-party net outflows amounted to € 47 bn in the third quarter of 2014. Total revenues from our Banking operations (reported in our CorporateandOther businesssegment)increasedslightlyto € 135 mn. 3 Total revenues comprise statutory gross premiums written in Property-Casualty and in Life/Health, oper- ating revenues in Asset Management and total revenues in Corporate and Other (Banking). 4 Effective 1 January 2014, the ­Allianz Group allocated certain entities from the reportable segment Asset Management to the reportable segments German Speaking Countries, Western & Southern Europe and Growth Markets within the business segment Life/Health and to the reportable segment Banking.